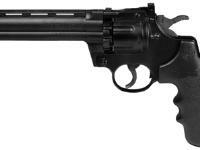 Ten-shot pellet repeater, real revolver mechanism, single- or double-action! This gun looks like the Colt Python and shoots 10 pellets as fast as you can pull the trigger. 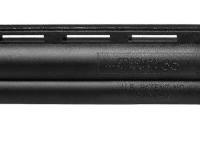 Powered by a CO2 Powerlet, the Crosman 357W has a 6" rifled steel barrel. 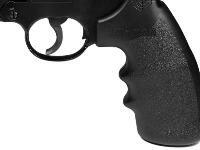 The molded combat grips have finger grooves for added control (it's truly ambidextrous!). 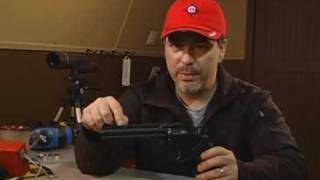 It's so realistic, your friends will have a hard time telling the difference between this and the firearm, although this airgun is lighter. 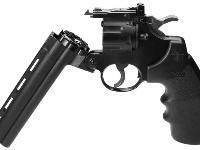 To load the gun, break it open in front of the revolver mechanism. Instead of loading pellets directly into the wheel, you pop in a preloaded circular clip. Close it up and commence shooting! You'll get plenty of shots before you have to replace the CO2 cartridge. The rear sight is fully adjustable, but feel free to add a red dot on the 3/8" dovetail! 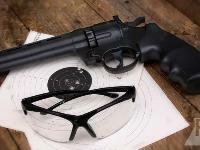 This is a great gun for shooting tin cans, plinking, hitting spinners and more. It's an all-day shooter, so stock up on pellets and CO2! Click the AMMO link to stock up on appropriate pellets. Check the ACCESSORIES link for economy packs of CO2 cartridges, targets, maintenance gear, red dot sights and safety glasses. Things I liked: Unbelievably low price. Good accuracy for a cheap repeater. Great single and double action trigger pulls. 10-shot capacity. Good compromise of velocity and shot count. Pretty quiet for a pistol that breaks 400 fps. Easy to convert to a remote tank. Things I would have changed: Make the grips fit the gun a LOT tighter. They are very loose on every one of these that I have handled. 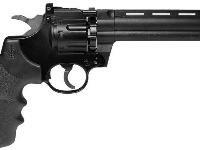 Ditch the safety; it's a revolver. 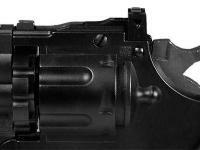 Make the barrel more permanently fixed to the barrel housing. I see no reason to need to be able to remove the barrel, and the flimsy way it is retained hurts accuracy. Make the rail a bit wider to actually secure an optic, and make it rigid instead of flimsy. 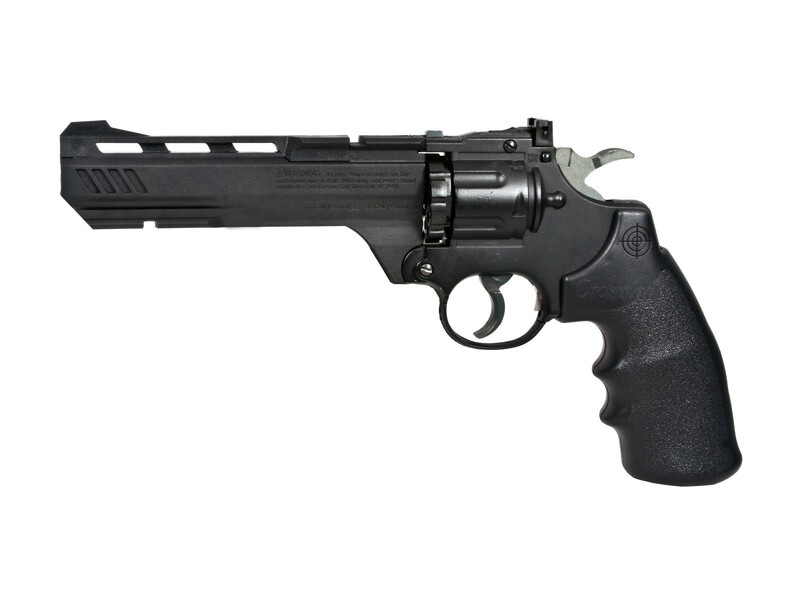 What others should know: This is a wonderful action pistol for popping cans out to about 15 yards or practicing fast shooting. This is a poor choice if you want an optic. The mount is not stable, nor is the pistol accurate enough to warrant a scope. I converted mine to a remote tank with a macroline and it really brought the gun into its own. I used a tiberius arms bulk adapter for a paintball marker and it worked like a charm. I get well over 4000 shots from one 24 oz co2 tank. I think I will probably try regulated hpa at 1100 psi next to see if power and accuracy improve. I am getting 5-shot groups averaging around 1.5" at 10 meters from a rest. Most groups have 4 shots in under an inch, and then a flyer that opens the group up. The pistol does not favor any particular pellet so far. Things I liked: Love it. 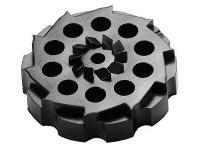 Out of the box shot quarter size group (single action and braced ), strudy construction. Use to work on trigger control practice and to relax. Things I would have changed: Would like it in 4"
Things I liked: Light Weight, accurate and it fires pellets instead of bb's. I've had mine for a good number of years and I have used this one to put an up close finishing shot into a groundhog that was undermining our apartment foundation. I know the gun isn't recommended for that but it's what I had at the time and it did the job cleanly and humanely. Things I would have changed: For what it is, I don't think I can ask for a better pistol due to the fact it has done everything I have asked it to do. What others should know: If you want a decent target gun you can definitely do far worse than this gun. It will do what you ask of it and it will exceed it's limits on occasion. Can a gunsmith lighten the trigger pull, say by 50%. I just can't get used to the heavier trigger pull. 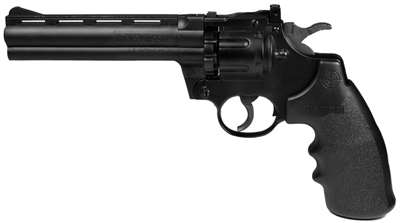 10-shot repeater, revolver mechanism, ideal for plinking and fun!